Reed awoke one morning to find the city out of focus. First he thought his kitchen window was dirty. Then he worried his eyesight was damaged. But neither was the case. In truth, the skyline, the towers made of bricks, mortar, steel, and glass were fuzzy. The tallest towers were even missing their tops. Reed pondered whether or not to have breakfast. There was no reason not to, but he supposed that an entire city being out of focus deserved a symbolic change in one’s daily pattern, as when an acquaintance dies or a catastrophe occurs. In the end, out of respect, he made only toast. And he snuck a banana on his way out of the apartment. First, he needed a second opinion on the blurred skyline. He was still afraid he might be experiencing a stroke or an exceptional midlife crisis. Does 32 qualify as midlife? His building manager Daisey was standing outside the front door staring at the skyline. “The buildings are fuzzy,” she responded slowly. “Yes. OK, good.” And he was off. He walked downtown. As he drew closer to the buildings, the blur intensified. Like standing too close to an impressionist painting. Perhaps a new kind of fog has rolled in. The sentence scrolled across his mind. He felt like a scientist in an action movie whose sole purpose was to regurgitate exposition. He was immediately ashamed of the poor dialog. As he scanned his vocabulary for better word choices, a new thought sparked to life: How will I work today? Reed was a receptionist at a health clinic. He had held the post for five years, despite its irrelevance to his Forestry degree. It was an unchanging job with an exquisite mundanity to it. Reed found himself disappointed he would not be seeing his desk today. The buildings and streets grew hazier. It gave Reed a headache. By the time he reached the downtown core, he felt inebriated. His shoes disappeared into the ground, the once solid asphalt, nevermore. It reminded him of a dream he had as a boy: walking uphill on a street coated in fresh fallen maple leaves and buried under a 3-inch pool of water. He missed those kinds of dreams. Then it dawned on him: There was no one else downtown. No people, no cars, no buses. 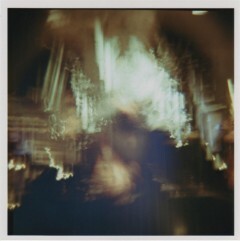 Perhaps he, by virtue of being downtown, had become part of the blur. Reflexively, he checked his own hands. But they were crisp and clear against the cloudy background. He reached out to touch a building. His hand passed through several inches of wall before he retracted it, unconsciously wiping it on his jacket. Finally, around one corner, he saw a blurry figure walking toward him. “No, you look great,” Reed’s compliment reflex responded. “You can’t see me, can you?” she asked. Reed shook his head, then said “No” a moment later, forgetting that she could see him just fine. “I can’t get a signal,” she said. Reed thought she appeared to be holding up her phone. “I’m holding up my phone,” she confirmed. “But your husband…won’t this all sound strange coming from a stranger?” Reed disliked having to be the more socially conscious of the two. The blur lady relayed a rather lengthy message to deliver to her potentially blur husband. Her name was Claire. Her husband’s name was Matthew. Her phone number spelled out NIGHT TACO 1. She wouldn’t have time to pre-prepare dinner, so could Matthew put on the rice and make sure the chicken was thawed out. Also, the Rutherfords would need to be told to arrive a little later. But they were to be phoned, not texted. The new light bulbs were in the utility closet, the one on the main floor. And the laundry didn’t have to be folded, but it would be nice if Matthew had time. Claire then walked away rather abruptly with a “Thank you”. A whole minute passed before Reed realized he didn’t have his phone. The thought that he had ruined Claire and Matthew’s dinner plans weighed heavily on his mind. It became Concern #1. For half an hour, he wandered the headache streets looking for the Claire blur but could not find her again. By this point, he was done with out-of-focus buildings and searched for an exit. But he couldn’t orient himself, so thick was the non-fog. Street names and other familiar sights were obscured beyond recognition. A thought stuck in Reed’s brain like a thorn: What if everything around him had devolved into a solid cloud since he arrived? How would he get home? And then a door appeared. It was painfully crisp and detailed compared to everything else. Familiar too. It was the entrance to Nathan’s Bar. Reed had passed by the wooden door many times, occasionally wondering what it might be like to head inside and end his work day with a hefty brew. Those moments of wondering were the only times he had ever conjured the phrase ‘hefty brew’ in his life. And here now was his chance to graduate from wondering to action. The chance to become a man who drank hefty brew. The chance to toss back a pint in the mysterious ale hall that presumably belonged to Nathan. The chance to look at that oak door every day from here on out and say “yes, I have passed through that door”. The door which, upon closer inspection, was decorated with intricate carvings that spread from its four corners toward the center. They looked Gaelic. There was no way for Reed to know for sure – he had only seen Gaelic designs on an embroidered flag in a high school textbook. Or a website, he couldn’t remember. But now the door was a symbol. It was a door that recalled ages past but also put Reed’s life into perspective. It was also the only non-blurry thing downtown. An anchor. Perhaps this was Reed’s moment. The beginning of a new chapter. Reed stared at the door for another five minutes before he walked on. It was midday. The city was transforming more and more into cloud. Reed found an old bus schedule for Route 20 in his jacket pocket. He began reading it periodically to offset the effect the monstrous blurriness was having on his eyesight. Route 20 was a bus he had taken once to visit the Aquarium. That had been a strange day. He had been on the verge of setting out for work in the morning when he received a phone call from Judy at the health clinic. She said there had been a shooting on the same block as the clinic. The entire block had shut down and he would be unable to come in. He thought it ironic that he couldn’t go to his job at a health clinic where there might very well be shooting victims seeking aid and possibly scheduling follow-up appointments. Nevertheless, he took the opportunity to visit the Aquarium instead. He had been reading a lot about marine life online and thought the serene creatures of the ocean might be therapeutic to offset the murderous news. First, he stopped at a cheesesteak shop he had always wanted to try. It was dreadful. Their sign had boasted ‘The Original Cheesesteak’. It did taste old. Perhaps he had actually eaten The Original Cheesesteak. In any case, he arrived at the Aquarium on the Route 20. The Aquarium was expensive, but at least it was uncrowded. Reed wandered from tank to tank, starting to wonder if visiting the Aquarium for inner peace was a bad idea. There was an electric eel hovering in its tank. Reed aligned himself so he stared directly into the eel’s eyes. Perhaps he was hoping to share some sort of connection with the creature. After a minute, the eel’s tail moved swiftly. Reed didn’t understand what happened, but the eel let off an electric charge and then was dead. There was no doubt about it. The eel had committed suicide. It began to float lifelessly when Reed, scanning for bystanders, slinked away. He felt responsible for the creature’s death but wasn’t about to hang around to answer questions. He decided to call the whole adventure a bust and began to head for the door when he saw a glass column of jellyfish. Lit by soft reddish light, the gossamer jellyfish floated in space. They held no thoughts, they didn’t communicate. At least, not as far as Reed could tell. But the image was so calming that he found himself walking past the column and into the realm of the larger marine creatures. There were large coy and then baby sharks. Though he had never been particularly afraid of sharks, Reed now felt a quiet, respectful fear of them. He walked irresistibly further into the Aquarium until he found himself in a black room facing the Aquarium’s largest tank. Blue beyond blue filled the other side of the glass. It was a magic kind of blue, developed by wizards and fused with ocean secrets. It was like gazing into a separate universe. Reed was the only person in the room. He waited for something to happen, though time didn’t seem to move at all. After several non-minutes had passed, a thing within the blue could be seen. A Beluga whale floated from the stillness of the magic universe and swam up to the glass wall. It looked squishy and unearthly. It also had a permanent grin on its face, which unsettled Reed at first. But the depth of its eyes denied any observer the ability to joke about or become repulsed by the grin. It stopped in front of Reed and stared at him. For a moment, Reed was worried it was going to kill itself like the eel. In fact, he was suddenly concerned he possessed the ability to reveal to sea creatures the absolute irrelevance of living. But this whale was very unlike the eel. It was the exact opposite. Reed took this staring contest as a sign that he had tapped into a subconscious pocket of thought and emitted a long hum. The whale continued to float in space. Reed would take quick breaths to transform his hum into a sonic continuum. The whale slowly turned itself upside down, maintaining its gaze. This excited Reed, which caused the hum to increase in volume. Then a small boy entered the room and stood next to Reed. Reed was aware of the boy but felt he could not break his cosmic line of understanding with the Beluga. The boy stared at him. Stare and wonder, my boy, Reed thought. The child turned to face the whale and abruptly joined Reed’s hum. But the boy didn’t close his mouth, so it came out more like a glottal ‘nnnnnnnnnnnnngggggggggggggg’ instead. This irritated Reed, made worse by the whale diverting its attention from Reed to the boy. Reed also opened his mouth to match the boy, but the whale would not return its gaze. When Reed finally turned and left the room, the boy’s sound had grown more hideous. Or maybe it had sounded that way the whole time. Reed strode out of the larger tank area, past a small crowd that had gathered around the electric eel tank, and out the front door. But despite his mild frustration, he could still hear the hum in his mind. It permeated the air and turned it into spirit air. The mindsound overlapped with the disembodied eyes of the Beluga and the floating reddish jellyfish. The effect created a blue in Reed’s mind that matched the whale’s universe. And then he threw up his cheesesteak. Reed was beginning to memorize the timetable for the Route 20. He checked his watch. Noon. Normally, he would take his lunch now. The soft blob nature of everything was making him drowsy. He sat down on what appeared to be a concrete staircase. It felt as soft as it looked. He let himself doze off, the vague swirl of drab color around him giving way to darkness. Reed’s dream world was sharp, clear, and colorful. It was a room with blue carpet that contained repeating yellow triangles. Some unoffensive art trapped in unoffensive frames hung from the walls. Soft lights shined down. He was behind his large desk at the clinic. Every object – pen, sticky note, tape dispenser, stapler – was arranged to his liking. They were subjects in his kingdom. He couldn’t stop observing them. A man in his late forties approached the desk and asked Reed something. But the words were muffled and fuzzy. Completely incomprehensible. Smiling, Reed nodded at the man, gave him a form on a clipboard with a pencil attached by a string, and entered some data into his computer. The man walked away and Reed resumed marveling at his desktop. It was perfection. His vision became momentarily blurry, but only because of the tears welling up in his eyes. He caught the tears before they fell onto the desk. John Osebold makes work in music, theater, video, and literature. Results have included collage films with live score (MOUNTAIN, Long Distance!, WWSD), a deconstructo-comedy about the Spiderman musical (Spiderman in Seattle and NYC), theatrical concerts (symphony, Universal Translator), stage performances of literature (Seateeth, Ministry of Poems), and an annual December album project posted at josebold.com. He is fortunate to have been published in Filter Literary Journal vol. 2 & 3, Folio, City Arts Magazine, and now The Monarch Review. His hair is very long and healthy.